Home / Credit Repair Blog / How much money should you save in case of an emergency? 00:00 All right guys. Credit question of the day. And we’ll actually make this a finance question of the day, is coming from [Sherry Lynn White 00:00:06]. 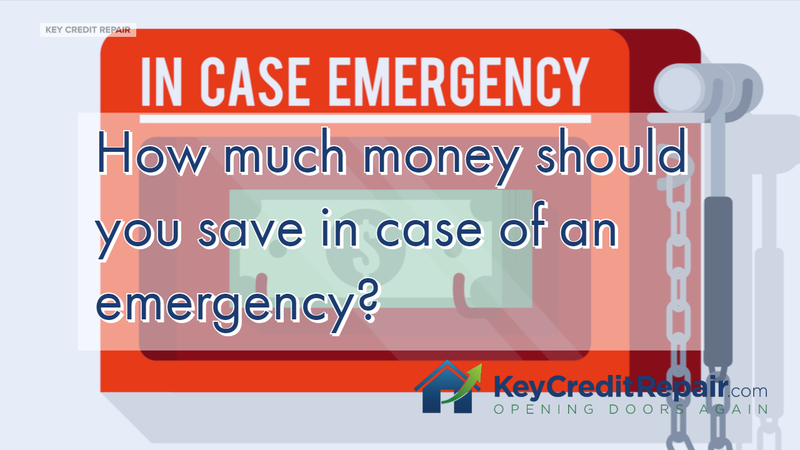 Sherry Lynn thank you so much for posting your question on our Facebook page and the question is: How much money should you save in case of an emergency? Well, let’s think about this. In 2008, I would have said a year’s worth. Why? Because when people lost jobs in 2008, it took a lot longer to get a job. Now, the economy is a little stronger, if you’re going to apply for another job, it might be a shorter time frame. So, I would say the minimum should be six months. Okay. You want to look at all of your monthly expenses, you should be able to jot this down on a small piece of paper, even a napkin. Jot down those expenses, times six, that’s what you want to have in the bank. Now, if you’re getting out of debt, I would suggest actually putting that to the side. Okay. The debt’s probably costing you 20 plus percent, get a $1,000 in the bank, just in case of an emergency, something breaks down, you got a car issue, you need to rent a car, something happens. Okay. And attack the debt, don’t worry about your reserve. 01:03 SO the order is, put a thousand bucks in the bank, pay off the debt, and then move to get six months reserves. And once you’re done with the six months reserves, then you want to start investing in putting money into retirement. Thanks, guys. Have a great day.